Using websites is one of the easiest and less stressful ways of integrating technology into the classroom. There is a plethora of constantly expanding collection of resources on the web , at a variety of levels and covering an amazing array of topics. You can choose from authentic ( written for internet surfers in general ) sources or ELT specific sites ( made by , and for , teachers ), monolingual sites , sites with multimedia , or just simple text for those on slower connection. as printed pages in cases where there is no computers or where there is a limited access to the net. Teachers can just print out a couple of pages containing the targeted items they need to use in the classroom and then zerox it for the rest of the class to have . with one computer with an internet connection .There are many schools that do not have enough computers to cover all the needs of teachers and students , in this case one can have access only to one computer and with the use of data projector or an interactive whiteboard the visibility can be greater for the whole class and the benefit is generalized. In a computer lab with a set of networked and interconnected computers . This is the ideal situation any language teacher would aspire for . It is very important that teachers should organise regular get-togethers with their learners to explain to them the advantages of learning through technology . It should be clear to all language learners that the use of internet is an intrinsic part of their overall language development process and is not a pass time or an occasional activity that has nothing to do with their study program . have easy structure and navigation. smaller chunks of text by page. you can also provide for your learners some useful online dictionary sites to help them along their electronic classroom learning. Technology in language teaching is not new . In fact , the use of technolgy in education dates back to the 1960s and 1970s . Tape recorders , language laboratories and videos were in use in many classrooms in all around the world . Computers were the primary source of materials in the form of visual stimuli to which learners had to respond and carry out different tasks. This method is actually the one that gave birth to the Computer Assisted Language Learning ( CALL ) approach . 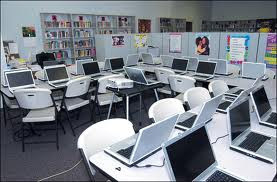 learners would depend on computer programs to consolidate their knwowled ge and develop their basic skills . Tasks such as filling in gapped texts , matching sentences halves , multiple choices , and text reconstruction were probably the most renowned CALL activities in the 1980s . The feedback learners would get from computers used to range from simple true/false answers to a more sophisticated system of response that would even brief the learners about the whys of their mistakes and would provide the necessary remedial work . With the rise of internet phenomenon and its widespread easy access , CALL has shifted its focus from depending wholly on computer programs to embracing the use of internet and web-based tools . The term TELL ( Technology Enhanced Language Learning ) appeared in 1990s thanks to the wider possibilities offered by the internet and communication technology . opportunities for authentic tasks . access to a wealth of ready-made ELT materials . opportunities for collaboration and communication between learners who are geagraphically distanced. Prolific online links and resources for learners to deepen their knowledge and sharpen their skills. These techniques have far improved the quality of language teaching and is still helping with the normalisation of technology in language teaching , where the use of technology in teaching would be just as natural as the use of books or pens and papers. Unfortunately , a general lack of ICT training for teachers means that we still have some way to go until this normalisation is completed and the digital divide is bridged . Unless the training bodies seriously address the issue of ICT integration into ELT some teachers will still hold negative attitudes towards technolgy and technophobia will still cloud their vision and hover over their heades just to turn them into digital immigrants who have come late to the world of technology , if at all . In many cases teachers become the digital immigrants and our younger students are the digital natives . What does it take for a teacher to use ICT in the classroom ? It really doesnt take any sophisticated and technical knowledge of softwares and programming languages much as you dont need to be a mechanic to drive a car . Try to be a technogeek ( a term for a technology enthusiast ) and fight those negative attitudes about computer .Befriend technological tools and see by yourself the benefits of using technology in the classroom. Do you know how to use email, a word processing program ( like word) and the internet ? I am quite sure everybody handles that easily .This knowledge is certainly enough to get started with usning trechnology in the classroom . There are also several online platforms and teacher development groups dedicated to exploring and learning about the use of technology in the classroom for teachers to join .You can benefit alot from them , ask for help from other colleagues and read others' experiences with ICT, they are just people like you who have started from scratch and turned their classrooms into a real language laboratories. Don't be afraid you are not alone , there are several teachers out there who are ready to give you a hand .Don't hesitate to google it and you will have access to a plethora of technology-based resources and materials that would tremendously facilitate your teaching and render it enjoyable .Dont forget , it's only the first step that counts.